The idea has captivated me so badly that a number of wild cats as well as a wolf and a fox are on their way to be born. This Moose is my husband's favourite. Many many people who love wild nature like me would prefer to see or just know about animals, living safe and sound in prairies and forests. And first of all, for us, taxidermy is killing for fun. Needle felting saves the World! 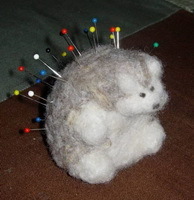 A good needle helps to create extremely realistic models of animals. Made of natural materials, they can adorn any house. Sometimes it's a lot of fun to make something from scratch. To find a good bulk of clay near a local river, to mix it, to create a teapot on a potter's wheel. Then to mix several glaze colors and hope they'll look similar after drying. The last but not the least is to keep 1200 degrees in the stove. Skipper! Rico! Kowalski! Private! Mission completed. Well, these little mischievous guys took several days of my life. But even I enjoy the result. 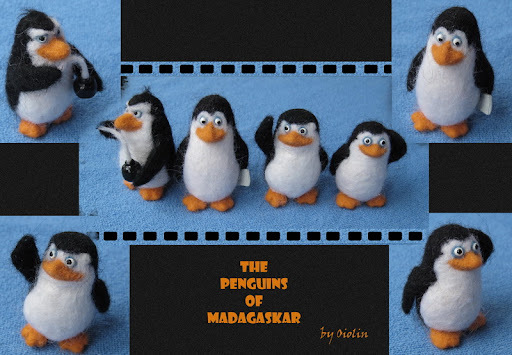 Four Madagascar Penguins is about to be born as felted models. It’s an originally designed model of a Koala Bear. This Australian funny bear will feel great on any plant in your house. 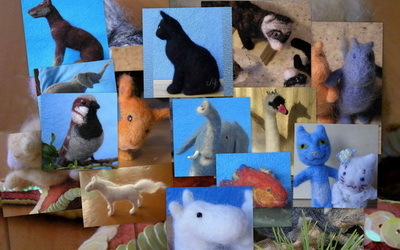 Needle felting is a popular fiber arts craft conducted without the use of water. Special barbed felting needles are used by the artist as a sculpting tool. A needle is used to sculpt the wool fiber. The barbs catch the scales on the fiber and push them through the layers of wool tangling them and binding them together. Fine details can be achieved using this technique and it is popular for 3D felted work.